Celebrate National Fun at Work Day at Jumba Bet Casino. Although you may need to work on the National Fun at Work Day, begin celebrating now and through the weekend. There are a number of special offers, each of which needs to be claimed in sequence. Just to get started, Jumba Bet Casino is offering you free spins, and bonus money, in its Party Favors promotion. 20 free spins on the Wolf Street slot game. Enter the coupon code PLAY20 to begin the fun. Make a $100 deposit and get a huge 100 free spins on the Alpha Squad slot game. Simply enter the bonus code PLAY100 to get going. Next up is a $10 of bonus money for you to use for play on the Johnny Jungle slot game. Redeem this bonus offer with the PLAY10 bonus code. The party just went crazy with another four sets of special bonus and free spins offers. Jumba Bet Casino suggests you get groovy with a 100% match deposit bonus using the code PARTY1. Next up you can redeem 50 free spins on the Bucksy Malone slot game. Enter the coupon code SPIN01 for the 50 free spins. Now it’s time to rock this party with a 105% match deposit bonus offer. Redeem your bonus with the PARTY02 code. After that, enjoy $10 of bonus money on the Tipsy Tourist slot, which you redeem with the SPIN02 coupon code. Clearly you have not yet had enough bonus fun, so it’s time to really get down to party hard. Play out a 110% match deposit bonus redeemable with the PARTY03 bonus code. Add in 60 free spins on the Vikingdom slot game to make it even more fun. Redeem the free spins with the SPIN03 coupon code. The final Party Favors offer is a 115% match deposit bonus offer when entering the PARTY04 bonus code. End off the party fun with $10 of bonus money for use on the Sin City Nights slot game. Redeem the bonus funds with the SPIN04 bonus code. 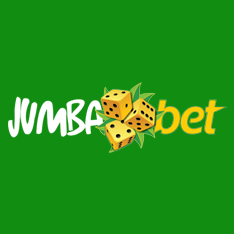 Jumba Bet Casino offers players a large and varied selection of slot games from BetSoft, Rival and Saucify. New players at the casino enjoy Welcome Offers that add up to a potential $1,200 in bonus funds. The casino also has Daily Match bonus offers, three hours of Happy Hour each day, and regular promotional offers. Last updated by Shannon on February 2, 2019 .